June officially kicks off summer for me. I know technically summer isn't until June 20th, but that doesn't matter. June to me, was always "no school", "late nights", and "sleeping in". One thing that hasn't changed- longer days. It's around this time that our lovely sun stays high above and shines it's rays a little bit longer. Sunsets tend to be more beautiful and the night becomes a warmer place to rest. I love summer nights. It even smells better <--- Is that just me? I chose this picture as June's desktop because it sums up the start of summer. I took it while at our local park, which is on top a cliff that overlooks the Pacific Ocean. Residing in the park are the most gorgeous trees, one of our lighthouses (which might be another desktop soon...), an amphitheater for summer plays, and endless grassy areas to lay out a blanket and have a picnic. This is exactly what we did this day. We packed up sammies, rode our bikes down to this park, hung out, ate, played frisbee, and just enjoyed the first warmer night until the sun started to set. Yay! 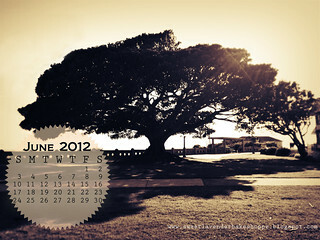 New Calender! Love the picture! For me, June 1 is the first day of summer!!!! I live for the summertime! Probably because it gets so cold & nasty here in the winter. Last summer I just had a baby so I was a little out of it and didn't leave the house much. But this summer i have big plans for fun fun fun!!!!! Wow what a crazy thing to think of- how drastically your life has changed between last summer, the summer before that (I assume) and this upcoming summer! I hope you and your lovely men enjoy the heck out of this summer!